"The Church's Prayers Are Answered"
If struggle is the cornerstone of success, then the Church could be on the verge of stardom. 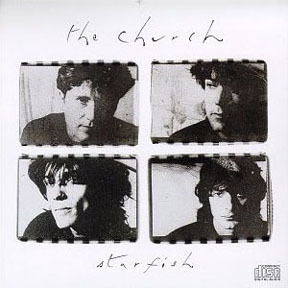 The Australian quartet's latest album, Starfish, comes after the group was dropped by both its U.S. and Australian record labels, experienced intense internal friction and then ultimately signed with another record company, only to do battle with the producers that label had selected. Yet Starfish, the group's new album--propelled by the shimmeringly psychedelic single, "Under the Milky Way" -- is looking like the breakthrough for the band after eight years of marginal visibility. "I keep thinking it's all going to end," said singer/bassist Steve Kilbey affably by phone from New York of the foursome's new-found success. "There's this initial rush and it's all just going to stop." Experience has given Kilbey good reason to worry: The Church's three previous American albums of heavily brocaded, plush pop--released by two different labels over the last seven years--were slow sellers. And even the band's home label, EMI-Australia, dropped the group after Kilbey proposed recording a double album. But then on a grueling 1986 European tour relationships frayed to the breaking point and the group temporarily fell apart. "It was a case of being awakened by a jackhammer in the morning, a baby vomits on your briefcase in the airplane, you stub your toe as you go through customs, your girlfriend's run off with the milkman and your guitar goes out of tune," Kilbey deadpaned. "Whether your record company's behind you or not gets to be a bit irrelevant at that stage." Kilbey left the band at that point, but a week apart proved sobering as he, guitarists Marty Willson-Piper and Peter Koppes and drummer Richard Ploog realized they wanted the Church to continue. Then, out of the blue in early '87, Arista expressed interest in signing the band; after all, it had managed to attract a loyal cult for its flowery lyrics and ringing guitars despite the travails. But another battle ensued after Arista suggested the group work with Greg Ladanyi and Waddy Wachtel, two L.A. session vets known for their work with the likes of Linda Ronstadt and Don Henley, and who had recently produced the Cruzados' album After Dark for the label. "It was Australian hippies versus West Coast guys who know the way they like to do things," reflected Kilbey, who has also released three solo albums (the most recent, the spacey Unearthed, issued here by Enigma) and a book of poetry. "We were a bit more undisciplined than they would have liked." Despite these differences, Kilbey liked working with the pair as they enforced techniques the band had previously avoided--including making the husky-voiced Kilbey take vocal lessons.